My friend Prachi tagged me on this meme on Facebook and I couldn’t agree more with her. When I started my career, my entire version control was folders – zipped, tagged and stored on multiple hard-disks. But then things changed. My guru Raj, enlightened me about advantages of version control systems. I learned about how multiple people can collaborate on projects or how errors can be reversed by going through code history if version controls like Team Foundation Server or GitHub are used. I started using those and these days, all my projects and samples are either in Visual Studio Team Services or in GitHub repository. Going one step ahead, I’m using Visual Studio Mobile Center for DevOps along with these version control systems. But what is this all about? How it helps in building successful mobile applications? And I thought about answering these questions in a video series. The goal is to explain mobile DevOps and different steps in mobile DevOps in small (less than 10 mins) videos. After completing this series, you’ll be able to build cross-platform Xamarin.Forms mobile application, which will consume Microsoft Cognitive Service and set-up mobile DevOps for the same. Watch the 1st video here about activating these tools & services to set-up mobile DevOps. 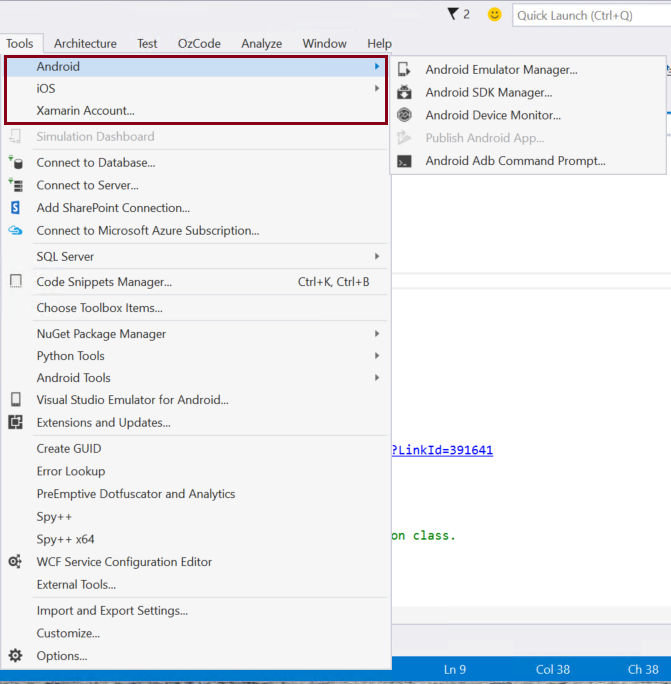 In 2nd video learn about how to setup build automation, using Visual Studio Mobile Center. I’ll update this blog post in coming weeks with the 3rd video in this series, which will be about building mobile applications. On 20th July, Microsoft released Visual Studio 2015. 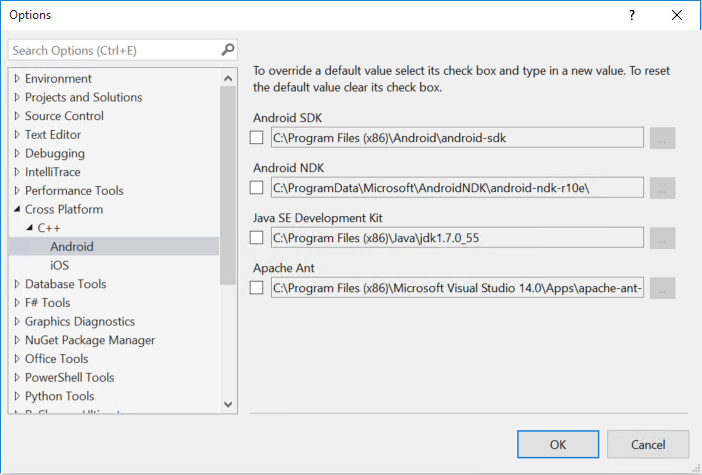 This release of Visual Studio includes improvements in terms of IDE features, Language features and even changes in underlying .NET framework. Along with this, Microsoft is also releasing Windows 10 on 29th July, which will add Universal Windows Platform (UWP) development capabilities to Visual Studio. In this blog post, I’m going to cover the features that are most important for us i.e. mobile developers. 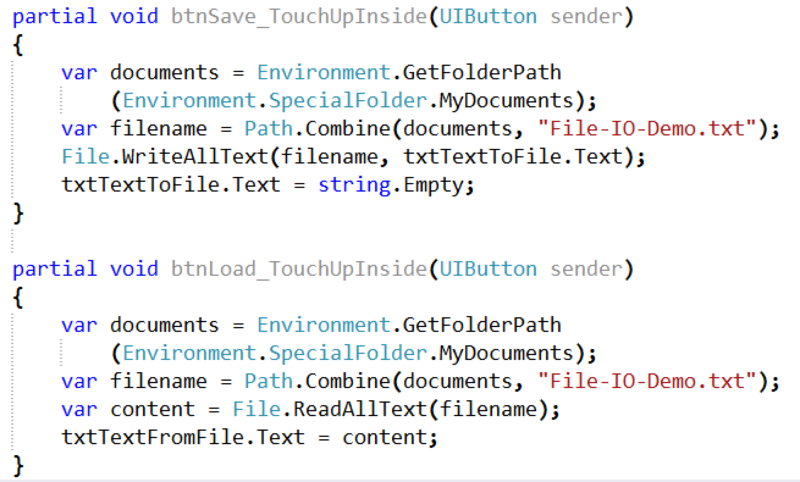 Having said that, if you want to build UWP apps on RTM, hold on till July 29th, as the SDK and tooling for UWP will be released on the same day. You can find that information here. 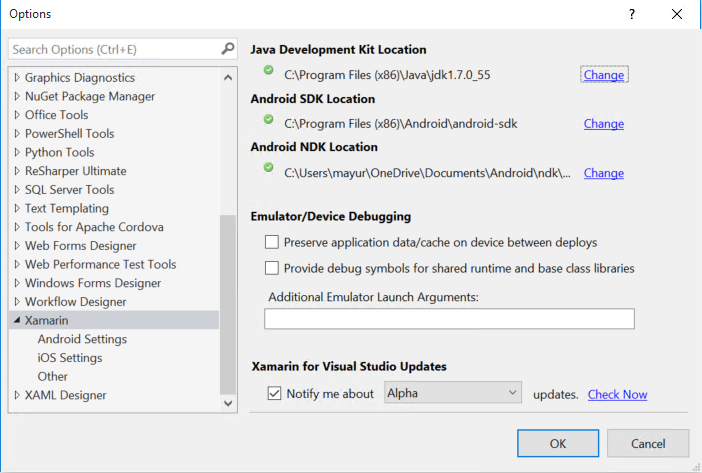 If you’re already a Xamarin developer, you may want to install Xamarin Studio, which needs to be installed separately by downloading Xamarin Installer from the site. 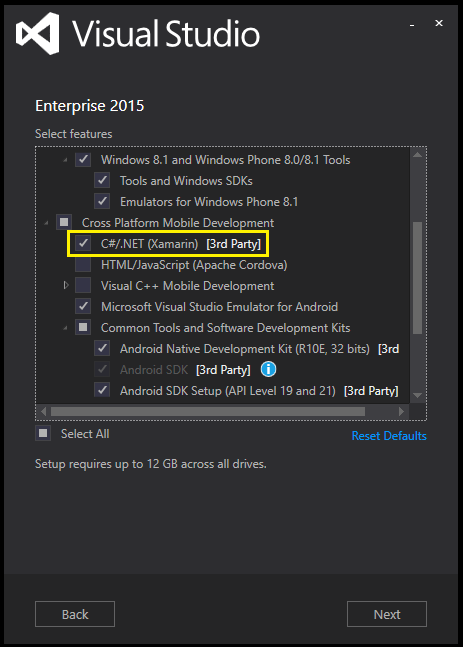 With open sourcing of .NET and Roslyn, even Xamarin Studio is using some of its benefits. You can read more about it from Miguel’s blog. 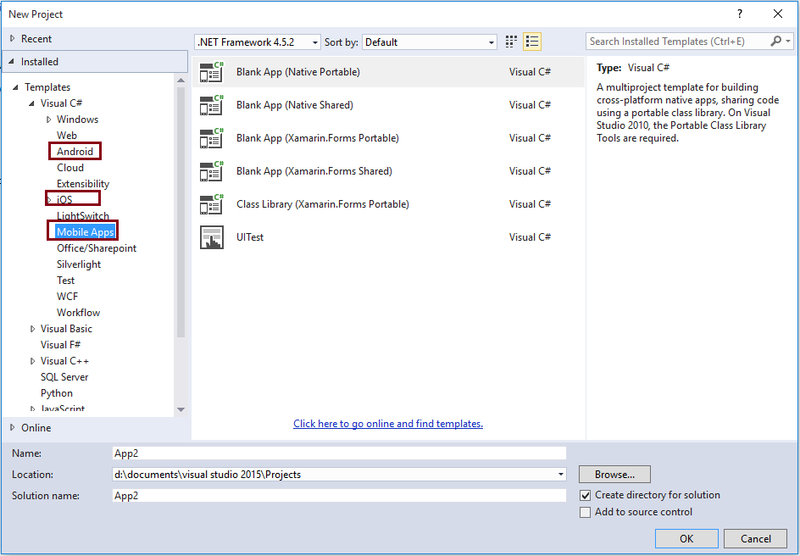 Previously (VS 2013 or prior), you had to install Xamarin to get Xamarin specific project templates. With VS2015, if you select above option during install, you’ll have Xamarin project templates in File > New Project Dialog. Note: The difference between Blank App (Native Portable) & Blank App (Xamarin.Forms Portable) is literal. 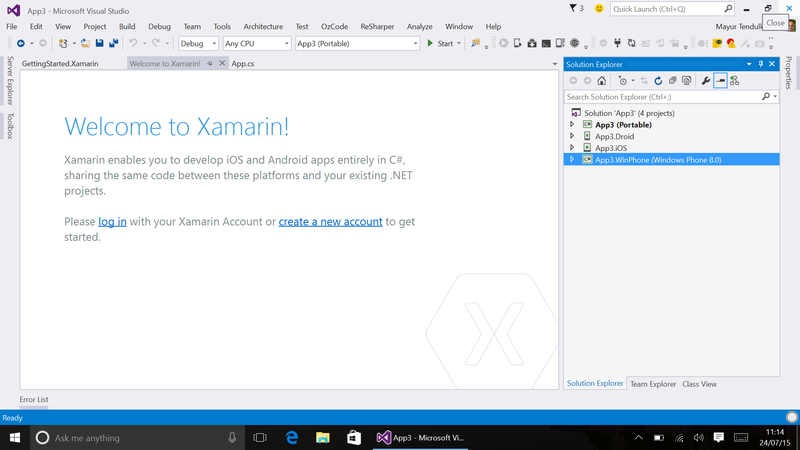 That means, later one has Xamarin.Forms NuGet and integration in all projects. 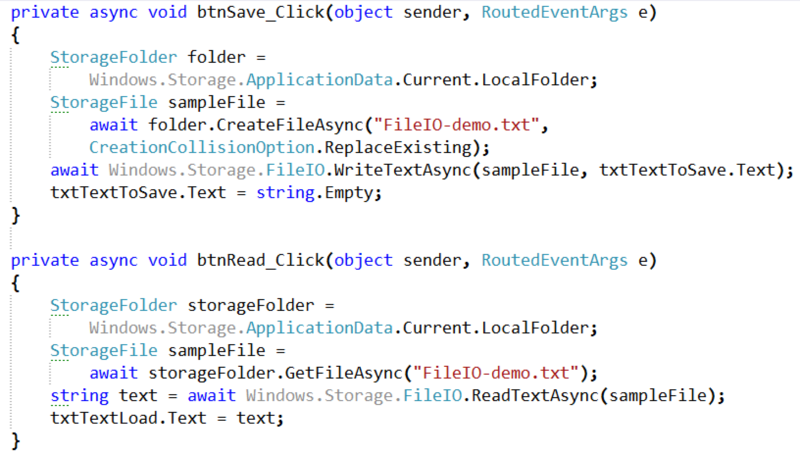 First one, just creates 4 separate projects without Xamarin.Forms dependencies. When you create a Xamarin project, Visual Studio will ask you to sign into your Xamarin account to use different features according to license. As I mentioned above, if you want to build UWP apps on RTM, you’ll need to wait till 29th July. 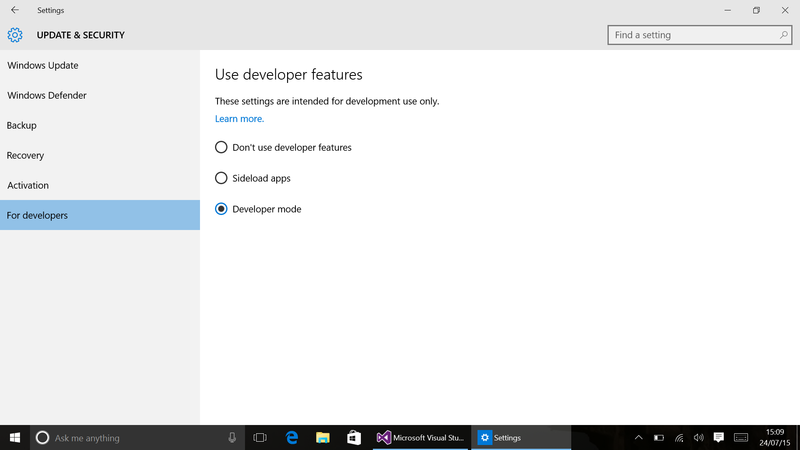 And to enable Windows Store apps development and debugging on your machine, you’ll need to enable a ‘Developer Mode’. When you create a new project you’ll get following dialog which can take you to next dialog, where you need to select ‘Developer Mode’ and you should be able to test your apps. Do the same thing in your Windows 10 mobile device, if you want to debug apps directly on mobile. 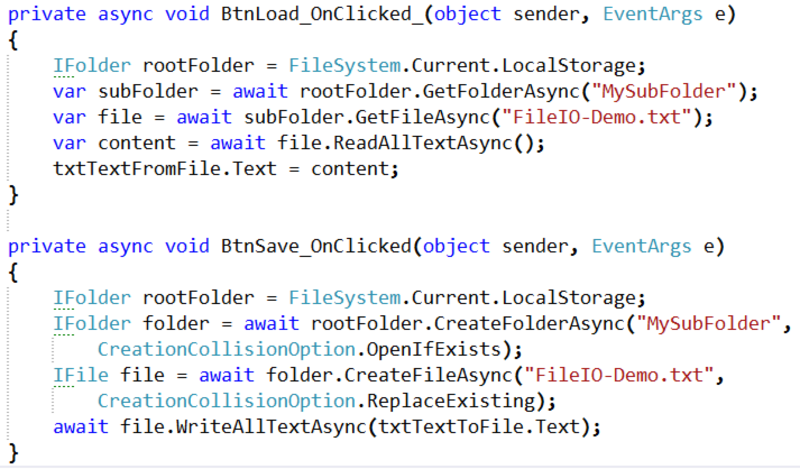 This is not new as such to Visual Studio 2015, but I want to add it here for your reference. You can find all the tools and setting related to Xamarin and mobility under Tools menu. So, if you want to download new API Level (for example Android M Preview) or monitor your Android app’s performance on device using Android Device Monitor, you know where to look for. We’ll cover tools and features exclusive for Windows 10 in next post. I’ll update tendulkar-uvāca series with new tools and technologies once they are released i.e. after 29th July. Till then, download the Visual Studio 2015 and enjoy the new IDE & tooling. By the way, have I told you: You get Visual Studio 2015 Community Edition free for specific use cases and along with it, you get Xamarin Starter for free. If you’re a student, you can get more benefit through Microsoft DreamSpark program. In previous episode of tendulkar-uvāca, we’ve seen how we can setup our development environment using Visual Studio and Xamarin. In this episode, we’re going to see how we can use emulators to test and debug our applications. iOS simulators will get installed with XCode is installed. 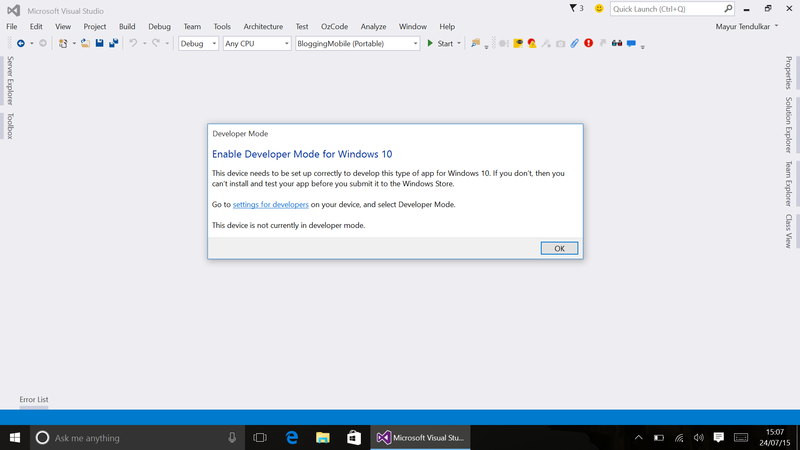 Windows Phone emulators can be installed while installing Visual Studio 2013 Update 3. Do let me know your feedback and suggestions. In continuation to blog posts in this series on plugins, today we’ll cover a plugin/library to perform FileIO. There are different APIs on different platforms to perform FileIO. Having said that, Xamarin already makes life easier by implementing System.IO which is available in Android and iOS. Following code can be used in Android to create a file and then read contents from it. Similarly, following code can be used in case of iOS application. 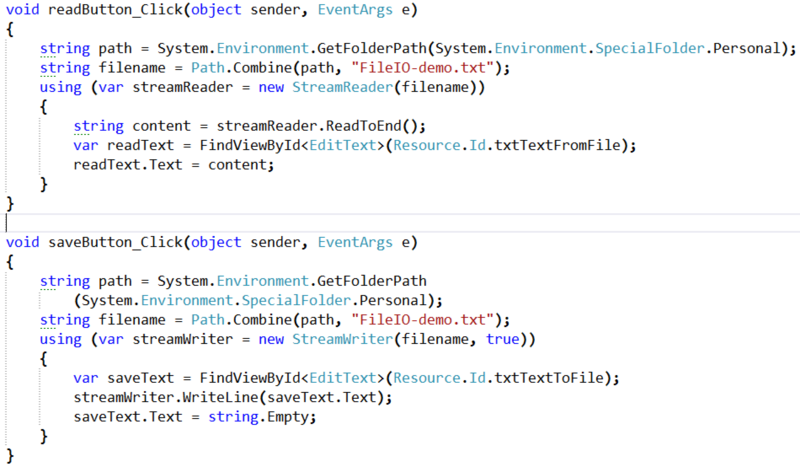 This way, you can use one code (in C#) across all the three different platforms. Hope you’re enjoying this series. Do let me know your feedback if you want to include any specific libraries/features. In continuation to blog posts in this series on plugins, today we’ll cover a plugin to make phone calls. In case of Windows Phone, one can initiate a phone call by using following code. In this case, Windows Phone has special class which allow developers to perform this task. In case of Android, developers can use ‘Intent’ and ‘URI activation’ to start a new phone call. In case of iOS, same concept of URI activation can be applied. As shown below in the code, developers can create a URI with telephone number and it will launch default application to make a phone call. Now, in case of Xamarin.Forms developers can use same Messaging Plugin for Xamarin and Windows plugin to implement phone functionality across the platforms. This way, developers can utilize the power of plugins to write one code which can work across different platforms, without bothering about underlying APIs.